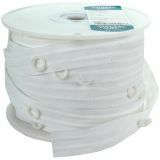 Austrian Shade Tape 1"X50yd - WRIGHTS-Austrian Shade Tape. This package contains one 50yd/45.7m spool of white 1in/2.5cm, 100% polyester two-cord tape with 5/8in rings approximately every 10in/25cm. Care: machine wash, tumble dry. Imported.